Birthplace : Brooklyn, New York,U.S. Yeasayer is a band based in Brooklyn, New York. The band's three core members, Chris Keating, Ira Wolf Tuton and Anand Wilder, first came to attention after appearing at the SXSW festival in early 2007. Their first single consisted of a double A-side of the tracks "Sunrise" and "2080". Following the release of debut album All Hour Cymbals in October 2007 by We Are Free, Yeasayer described their music as "Middle Eastern-psych-snap-gospel". Live performances often include psychedelic visuals. In 2008, Yeasayer toured with MGMT and Man Man and supported Beck. The same year they performed a public a cappella concert, "Take Away Show", on the Paris metro. The band has also played at Lollapalooza, the Pitchfork Music Festival, the Austin City Limits Festival, Bonnaroo, Sasquatch! Music Festival, and the Reading and Leeds Festivals. In 2009, Yeasayer contributed "Tightrope" to the AIDS benefit album Dark Was the Night produced by the Red Hot Organization. Yeasayer appeared at the Coachella Music Festival of 2010, the Dutch Pinkpop and Lowlands festival, and performed at the Australian music festival Splendour In The Grass in August where they were asked by the organisers of Laneway Festival to return and play in 2011.Backed by labels Secretly Canadian and Mute Records, Yeasayer released their second studio album, Odd Blood, in February 2010, featuring more pop music influences than earlier work. In July 2010 they appeared at Latitude Festival in England at the Word Tent where they also completed a signing session. In April 2011, Yeasayer released End Blood in participation with Record Store Day which the band described as "two ideas that that didn't fit on Odd Blood". Their songs have been featured on TV shows such as 90210, America's Next Top Model and The Good Wife. In May 2011 they premiered their brand new song "Devil and the Deed" on Conan O'Brien's late night talk show. During their subsequent tour of North America, the band played this song at shows along with two other new tunes, "Demon Road" and "Henrietta". 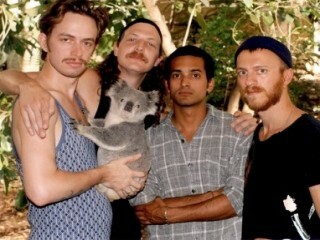 View the full website biography of Yeasayer.